ATLAS ELEKTRONIK GmbH As a leading naval electronic house ATLAS ELEKTRONIK stands for maritime and naval solutions both above and below the surfaces of the world's oceans. With the help of technical innovative products the electronics specialist encounters the conventional and asymmetric challenges of the maritime sector and increases safety of harbours, coastlines and trade. The company with its headquarter in Bremen was founded in 1902 and is now a joined company of ThyssenKrupp and EADS with more than 1700 employees. 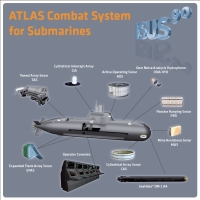 The ISUS 90 Submarine Combat System is an advanced and sea proven fully integrated sensor, command & control and weapon engagement system. It integrates the acoustical sensors with optical and electronic sensors to allow for a comprehensive command and control in the submarine system, as well as control of long range, wire guided torpedoes and missiles. The company provides command and control systems for OPVs, corvettes and frigates as well as integrated navigation systems. 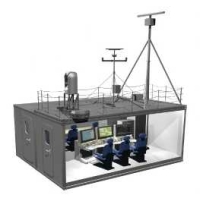 The Atlas Naval Combat management System (ANCS), our latest-generation combat system, has a modular design that allows it to be adapted to all customer requirements, and has all required interfaces to sensors, shooters and communication facilities. This in turn ensures its integration in a full network-centric warfare (NCW) configuration. The ATLAS Integrated Mine Countermeasures System (IMCMS) is a multirole MCM Weapon System which covers the complete process of Mine Warfare including Minesweeping, Minehunting and Minelaying as well as supporting functions such as hydrography, environmental assessment and surface and air surveillance. The system is based on open architecture and is operated from multi-function consoles allowing the control of each sub-system, such as the hull-mounted sonar, the self-propelled variable depth sonar, the autonomous underwater vehicle and the remotely controlled surface drones. The SeaFox system is a mine disposal system which is based on the "Expendable Mine Disposal Vehicle" principle (EMDV). The SeaFox I, a small, reusable and unmanned underwater drone, is used for inspection, identification and training purposes, while the identical combat vehicle SeaFox C directly disposes long and short tethered mines, proud ground mines and floating mines. The four independent, reversible motors plus one hover thruster ensure high manoeuvrability and exact positioning for firing the shaped charge. ATLAS ForcePro System offers the possibility of building up complete sensor-weapon chains, fusing all information from surveillance radars, optronic surveillance systems, and diver detection sonars. The ForcePro is based on the ANCS-technology and can be used against piracy, smuggling, terrorist or other asymmetric threats. Moving targets can be displayed on the land and sea map display, while the functional sensor-to-shooter chain ensures the capability for rapid action against threats from land, air, sea and underwater. ATLAS ELEKTRONIK provides a continuous support effort which is based on an individually tailored balance between the three key factors: affordability, availability and capability. The In-Service Support covers all areas, from hot-line support through engineering and on-site services, spares, training and documentation services. All services are also offered for external products.